Homes with Holiday Spirit in Atlanta! With Christmas right around the corner, homeowners everywhere show off their creativity and love of the holiday season with a beautiful display of Christmas lights. 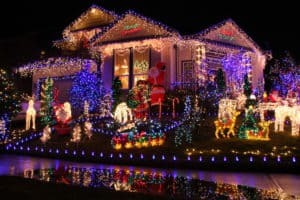 Although there are several places to go to see great lights such as Lake Lanier Islands, Atlanta Botanical Gardens and more, I hold a soft spot in my heart for a simple drive around at Christmas to find some of the best home displays. If you’re like me, here is a list of some homes to see! To make it easy, use our interactive map! We hope you get a chance to see some of these homes and get in the holiday spirit! And if you’re looking for a new home of your own, The Peters Company would love to help!